Stroke. 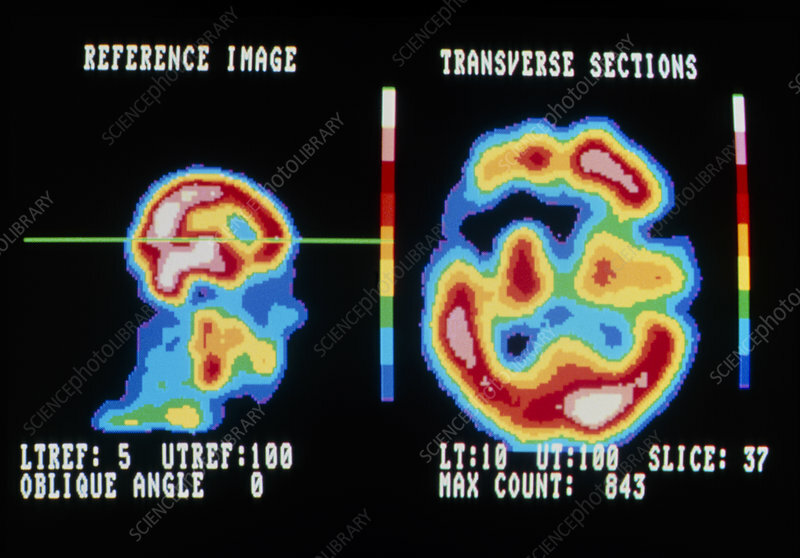 Coloured scintigram of a brain affected by stroke, in vertical (left, profile) and horizontal (transverse) section. The green line on the left shows the position of the horizontal section. Red and white show areas of high activity; blue and black show areas of low activity. Stroke occurs when a blood vessel in the brain is blocked or ruptured, damaging brain tissue. The black area in the horizontal section shows where tissue has died (infarction) due to lack of blood. Blood supply to other parts of the brain is abnormally low (ischaemia). The radioactive tracer used to highlight the area was technetium (99mTc). See P332/230 for comparison with a normal brain.